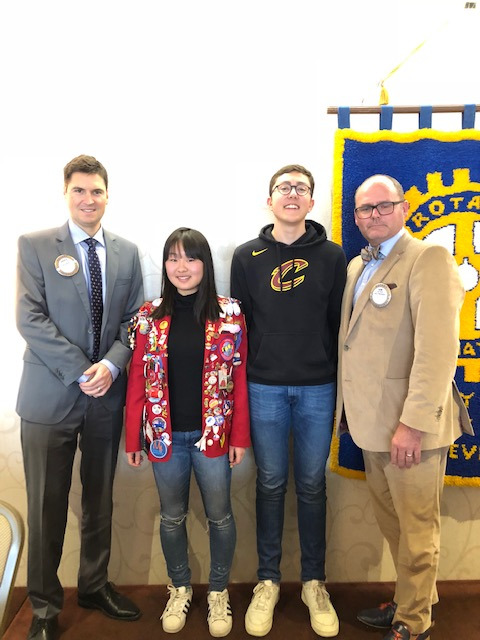 Sam Brady, Chair of the Rotary Exchange Student program, introduced first Gaspard Alavoine, joining us this year from Lille in the northern part of France (pictured L to R, President Andrew Bandler, Nicole Cao, Gaspard Alavoine and Past President Sam Brady). Gaspard was born in Lille, a big city in the northern part of France. Gaspard lives in a small village called Premesques, a rural area with lots of trees and only ten minutes from Lille. He has a sister Zoie along with his mom and dad. He attends school in Armentieres that touches the Belgium border, a beautiful campus of northern France architecture. Lille boasts the 4th largest stadium in France with 50,000 seats, Stade Pierre-Mauroy and Gaspard loves to go there with his family to see the Davis Cup. The stadium is known for hosting soccer and rugby, but can be converted for tennis and handball, a feature specific to that stadium. Lille has many historic sites and monuments at the Citadel of Lille as well the Palais des Beaux Arts de Lille, a museum of European fine art as well as a grand cathedral. The Canadian way of including "eh" when they speak is not the way Gaspard learned English and he finds it a little humourous. He is really enjoying his time with the Bradys and thanked everyone for their friendship and support. Next, Sam introduced Nicole Cao, our outbound student last year, a student at Moira Secondary School who went to Germany for the 2017/2018 school year. Nicole is in her final year at Moira. She shared photos of her year as a Rotary Exchange Student in Germany and although many people asked how her exchange year was, it is difficult for her to capture and condense all the memories into a single adjective. Nicole spent her time in Germany in a small town called Minden, population 80,000, 45 minutes went of Hanover and 3 hours east of Amsterdam. She could commute anywhere in town on her bike in 20 minutes since the landscape was very flat. The school she attended was Das Rasgymnasium, a university prep school. Nicole was very impressed by the diversity in terms of culture and history as she got a glimpse of everything from giant castles to medieval buildings to modern houses. It was almost enchanting. The country is very progressive with thousands of years of historical development and of course, played a big role in world history. Prior to her exchange experience, Nicole had only known Germany's history from textbooks, but had an opportunity to see history in all generations. For instance, her host grandmother's house was originally built during the war for low income people. Nicole's biggest regret was arriving ill prepared as far as the language department. The main language was German and no one spoke English when she was there. At first she relied on the smile and nod technique, but became proficient and improved every day until she was comfortable. Weekend tours were organized through the local Rotary Club and Nicole was able to establish relationships and connections with many Rotarians. She stayed with two host families and both were very important to her throughout the year, always supportive and patiently explained new vocabulary and grammar and helped her develop her confidence. But all in all, Nicole learned to become more independent and proactive. She joined rowing and even danced on stage with her class for a talent show, something her old self would never have done. She learned to take advantage of every opportunity given. She learned tolerance and understanding, interacting with exchange students from all over the world. Nicolle thanked the Rotary Club for the opportunity and helping her improve as a person.